Does the PDO drive global temps, and is there a Siberian connection? This is a post for those who like the intellectual stimulation of unraveling the cause and effect links at the bleeding edge. It’s a weekend puzzle. Frank Lansner (of Hidethedecline) wants to toss out his latest thoughts and findings for discussion. With a very simple equation he’s managed to recreate a curve just like Hadcrut temperature profile, using just the Nino 3.4 data (see Fig. 1). If it stands up, this would imply the Pacific Decadal Oscillation (PDO) pretty much determined a significant part of the climate — which is not a shock, but nonetheless there’s not a lot of room for CO2. The turning points do seem to match well (unlike the temperature versus CO2 “turning points”). As William Kininmonth reminded us, the oceans cover 70% of the planet, and are 4km deep, and most of that water is very very cold, even under the equator. If the surface of the central pacific cools by 1 degree does that drop global temperatures by 0.1C? Of course, the mystery of what drives the PDO still stands. 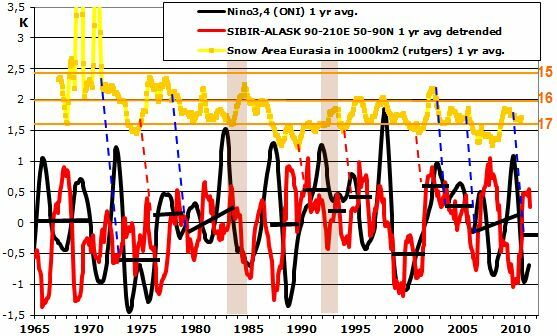 On that score, Frank looks at Siberia and Alaska, and finds an interesting correlation with the Nino3.4 when it is lagged by 15 -18 months. He’s chosen four zones in the Pacific and is looking for repeated sequences. As I said, this is all speculation, but kind of like a climate crossword, only no one has the solution yet. It’s heavy stuff, but I know some people will enjoy the challenge of testing Frank’s ideas. The Dane and his insatiable curiosity. The Siberian – Pacific climate pendulum. Fig1. The SST of the Nino3,4 area (5S-5N / 120-170W) in the Pacific Ocean seems to hold information on how global temperatures evolve, at least since 1920 where the first somewhat reliable SST data from the Nino3,4 area begins. The SST of the Nino3,4 area (5S-5N / 120-170W) in the Pacific Ocean might hold information on how global temperatures evolve, at least since 1920 where the first somewhat reliable SST data from the Nino3,4 area begins. For each month a constant fraction of the Nina3,4 index is added to global temperatures from the month before, and this approach seems to re-produce global temperatures rather well. The 1000 $ question is if this relationship will remain tomorrow ? Due to the above finding I carried out just a rough analysis of the climatic patterns in the Pacific Ocean. There are different writings on the subject, but I like hands on myself so I can investigate exactly what I find relevant. I have divided up the Pacific into the three zones, along with the well known Nino3.4 area. Fig2. The abbreviations used below correspond to these areas. In this analysis, temperature sets from the areas shown on fig2 are used. CRUTEM3 land temperature index 50-90N / 90-210E is used for the Siberia – Alaska (SIBIR_ALASK, red area) . For all Pacific areas on fig 2, data from HADISST1 is used. The area 50-60N/140-200E is called “NPAC_N” (for “North Pacific, Northern part”). More southern Pacific Ocean areas Northern Pacific –Southern zone (NPAC_S)and Southern Pacific (SPAC) will be used later in this writing. NPAC_N and NPAC_S often show cold SST during cold PDO, and thus these areas are in the following used as simple Sea-Surface-Temperature (SST) based indicators for the typical PDO patterns. Fig3. Comparison PDO vs. NPAC_N, trends have some similarities. Comparison PDO vs. the northern-most area of the Pacific (NPAC_N): Trends have some similarities. Fig 4. The years of Volcanic influence is marked with red vertical bars. The area, Siberia – Alaska (SIBIR_ALASK) on fig 2 was chosen since the typical W and NW winds is likely to affect Northern Pacific SST. On fig 4, we see variations in the area “SIBIR_ALASK” land temperatures from CRUTEM3 versus the Nino3,4 Pacific area SST. Often after Nino3,4 heat peaks, often rather similar heat peak appears in the SIBIR_ALASK area and vice versa. Definitely a “Chicken and egg” –problem: What is the cause and what is effect. In fact, the most satisfying explanation is proberly that Siberian air temperatures influences Nino3,4 temperatures with a 15-18 months lag and vice versa. Often this rhythm seem to be interrupted by some disturbance like volcanoes and more. However, the system of heat going forth and back between Siberia and Nino3,4 appears to re-establish quickly after disturbances. Volcanoes appear to take heat out of both Siberian and Pacific areas simultaneously. Fig5. The Siberia – pacific climate pendulum: Normally, temperature anomaly in Siberia appears 15-18 later in the Pacific Equatorial region and vice versa. The “Siberia– pacific climate pendulum”: Normally, temperature anomaly in Siberia appears 15-18 months later in the Pacific Equatorial region and vice versa. Siberia – Alaska (SIBIR_ALASK) temperature variations are normally followed by Northern pacific SST variations (NPAC_N) which again are normally followed by variations in the Equatorial Pacific regions, Nino3,4. Variations in SST for NPAC_S appears more random than NPAC_N. Depending on factors like the Arctic Oscillation – the NPAC_S heat variations can occur faster or slower after heat variations occurs in Siberia. A positive AO directs the wind further south directly from Siberia to the Californian coast, and this can switch the sequence of heating between the NPAC_N and NPAC_S so that the NPAC_N occurs later than NPAC_S. (This happened around “the great climate shift” in 1978). Besides AO and volcanic impacts, snow cover changes are likely to change the quantum of heat transferred from Siberia to the Northern Pacific possibly due to albedo change. For now, I do not have snow cover data from the specific SIBIR_ALASK area, just the full Eurasian snow cover trend. The red and blue dotted lines shows examples of how changing snow cover appear to affect changes the level of SIBIR_ALASK and Nino3.4 temperature anomalies. Let’s take a closer look at the possible impact from the Arctic Oscillation on the ability for Siberian air to flow over the Pacific. Fig9. For positive values of AO, winds from Siberia can reach the North Pacific easily, even as for south as the Californian Coast. Since air masses can easier leave the SIBIR_ALASK areas, temperature peaks and dives tends to get smaller. Thus, the NPAC_N SST is not only affected by the temperature of the SIBIR_ALASK air masses, but also by the volume of SIBIR_ALASK air masses moving towards the NPAC_N area to some degree regulated by AO. The graph on fig 12 was made using 9 sequences of data 1979-2008 where zero on the X-axis equals a minimum of the SIBIR_ALASK area. Doing so, shows more clearly the more normal sequence of heat variation: Siberia -> North pacific -> Equatorial Pacific. Further more, SST data from South East Pacific was included “SPAC”. These show that variations in the SPAC data appear to occur mostly just a few months before variations in Nina34 variaitons. The complexity of temperature movement and dynamics on Earth is overwhelming. This small analysis is just a scratch in the surface to roughly show some climatic patterns to put the stunning match between Nino3,4 SST and global temperatures fig1. in some perspective. From the black Nino3,4 peaks to red SISBIR_ALASK peaks fig 4, heat seems to shift location like the stone of a pendulum. Heat from the Nino3,4 can normally be found mostly all over the world. However, it seems that the heat “coming back” from just a smaller area (Siberia + SPAC etc.) often seems to generate a heat peak similar to the previous heat peak… That is, even though heat is distributed to the whole globe, the following peak appears to have the same quantum of heat. If this holds some truth, it suggests that a smaller amount of heat flowing to Siberia - possibly due to snow cover changes and thus albedo effects – is amplified before eventually reaching the Nino3,4 area again. So perhaps heat collected in the Nino3,4 area from the pacific is not only reflecting some passive oscillation of heat, no, it may also reflect the newly produced heat from Siberia (and possibly other areas), which would then make Siberia be an important climate driver. The mechanism of the “Siberian-Pacific climate pendulum” indicates as described, that heat to some degree may be produced in the process of heat transfer between the Pacific and Siberia. If so, the Nina3,4 heat peaks represents heat added to the Earths climate budget and the relation on fig 1. might make some sense. This is meant as an input for discussion – there are possibly other explanations. - Then for example just a shorter period in a La Niña mode would cool the planet notably. In fact, the relationship on fig1. seems to confirm that periods of numerous La Niñas cools the planet and periods of numerous El Niños warms the planet. Numerous La Niña occur during cold PDO, and numerous El Niños occur during warm PDO, and thus fig1 – if true – confirms that cold PDO cools the planet and warm PDO warms the planet. To see how the Pacific could control our air temperatures read William Kininmonth’s The deep oceans drive the atmosphere.